Sabbath Walk: Is Worry a Sin? TITLE: IS WORRY A SIN? This prickly question can be controversial. It invites all kinds of theological interpretations. It has the potential to split groups. On the one hand, there are those who insist that any forms of worry is sin. Some argue from the Bible that because Jesus calls his disciples not to worry, and if the disciples still worry themselves out, it is a sin (Matthew 6:24-25). This is based on the contexts of serving either God or Mammon. If one serves God, one will learn to trust God, and not be given into worry. If one serves Mammon, the pressure will be to perform and to accumulate to the level of our own expectations. Worry comes as a result of the lack of trust. That is why they say worry is a sin. On the other hand, others reason that there are legitimate worries. For example, a mother worries for her son when he fails to return home at his usual time. It can also be a frantic brother outside a hospital operating room worrying about his sister after a bad car accident. Is it a sin to worry like that? Wise words. I am inclined to agree with both of my learned brothers in Christ. There is a lot of wisdom in that. Yet, the questions remain. Is worry really a sin? How do we know when is it 'concern' and when is it 'worry?' The problem continues. As I think about it, one of the most important ways to determine whether something is sin or not, is to know the Scriptures. Here are some of the verses dealing with sin. It is the Word of the Lord that is the reference. Disobedience to it is a mark of sin. In other words, sin is not what we human beings argue out to be. Sin is defined by God in the Bible. The Bible deals with many different aspects of sin. There is no one concept that is nicely packaged for us to take home. I will draw out some aspects of sin from the Old and the New Testament. In the Old Testament, sin is basically disobedience to God, as evidenced in the Garden of Eden, where Adam and Eve intentionally ate the forbidden fruit. Then we have the intentional worshiping of idols by Israel through the ages. The Law of Moses are written to instruct Israel about what is sin and what is not. The book of Amos contains multiple references to the different acts of sin. "Sin is its own punishment, devouring you from the inside." Let me try to reconstruct our understanding of worry in terms of a legitimate human emotion. Jesus in Matthew 6 realizes this as a typical human reaction to the problems and the struggles of this world. His remedy is simple: Do not look at the problem of what we ought to eat, what to drink, or what to wear. Instead, look at the certainties of God's providence. Look at the birds of the air, and marvel at how God feeds them. Look at the flowers of the field, and take in the beauty of God's providence. A story was told of a man who happens to get everything that he wanted from the Lord. He planted an olive sap. He asked God for rain, and God sent rain. He asked God for sunshine and God gave sunshine. He asked God to provide frost to firm up the leaves. God provided the frost. However, by the evening, the plant died. "Lord, whether, rain, sunshine, or frost, I do not want to bind your hands, but trust you to provide for this plant. Amen." Through this story, it reminds us about who is actually trying to control life. Worry if it is an attempt to try to control events in this world, will lead us farther from God. Trusting God is a way that leads us away from sin. It is quite hurtful to tell people that worry is a sin. Let me say that worry is a human emotion that we need to learn to manage with faith and with hope. Where there is worry, sin abounds. Sin will try to manipulate oneself into thinking one knows best, instead of God knows best. Principle #1: Worry is not necessarily a sin, but where there is worry, sin is lurking very closeby. It is one thing to worry and then forget all about it. It is yet another, to remain in a state of worry. It is in this state that sin wields its most powerful influence. When we try to take control, we are not trusting God. We are trusting anyone or anything other than God. Christians sometimes pay lip service to their faith. On the one hand they say they trust God. Yet, in their private moments, they worry themselves to death. Like the serpent that tricks Adam and Eve into eating the forbidden fruit. The evil thought that is planted in their heads causes them to question God's original command. Their first result is to fear their own nakedness. This leads to the first murder where one brother killed the other out of envy. Cain's envy of Abel, leads him to take things into his own hands. Each act of sin moves people farther and farther from God. If worry causes us to move away from God, that is sin. For those who worry a lot, think of each worry in terms of an opportunity to trust God. Treat it as an invitation to start the journey toward a state of contentment. This is what Linda Dillow suggests. Learn to treat our anxieties and worries with a journey from control to contentment. Whenever things do not turn out her way, she worries a lot. Anxiety becomes depression soon after. It takes a friend to gently counsel her. "Linda, you like control, and there are too many uncontrollables in your life." Indeed. 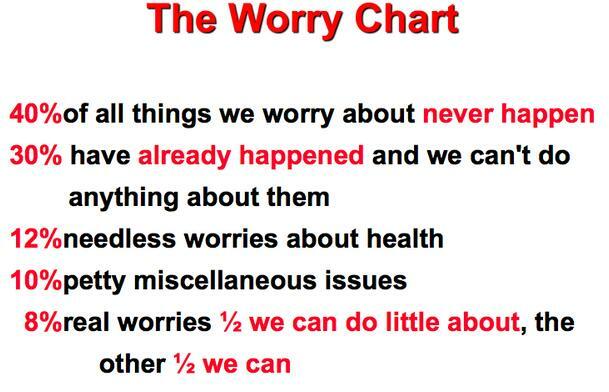 Worry is a sign that we are trying to control the uncontrollable. It is an attempt to wrest control from God. It is a stubborn retort that spits at God saying: "I know what is best." When worry orientates itself away from God, it becomes sin. If worry is turned back toward God, and the person embarks on a journey from control to contentment, it becomes redemption. It is ok to worry a little while. The important thing is not to remain in that condition. Worry is a result of our imperfect self, and it is not sensible to deny our basic expression of our emotions. It is a little bit like anger. We all do react angrily at matters of injustice. However, remaining in that state of anger for a prolonged period will breed harmful pride and destructive wrath. Righteous anger is acceptable. Jesus has been angry before at the merchants hawking goods outside the holy temple of prayer. It is normal for parents to worry about their children. The key is what happens AFTER the worry. Do we seek to grasp control for ourselves? Are we trying to claim we know best, more than God? Each time we worry, take the 3-step process. First, let ourselves a little room to express our emotions either through sharing with a friend or loved one. Keep a leash on the time. Set a worry time if necessary. Second, stop. When it is time to stop worrying, try to stop worrying. Pray. Meditate on the word. Third, trust. Memorize key verses in the Bible that enables us to trust. Let me share three. As for me, whether worry is literally a sin or not is not something we need to argue about. What is important is to love the person who are in the state of worry. Do not condemn or downplay that person's concerns. It is what that worry leads to that we need to pay careful attention to. Worry is not necessarily always sin. It can lead to sin. What matters is not to remain in the state of worry. Worry loves to feed on more worry. If needed, worry but limit the worry. Then stop and turn our eyes to God and trust God. I like what you wrote. I do kind of think that people who suggest that worry is a sin, puts more worry on the person already in a state of worry. Its a double edged sword. They already have something of concern, don't need to have them with the burden of being in sin aswell lol. I, in my worry, actually get closer to God. Such as now, I have a problem I have been worrying about and have therefor searched (which brought me here) to know about God and passages like Philippians 4:6-7. Typo: "...good of those who love him,j whok have been called..."